Seeking a safer and more direct wagon route to the Willamette Valley in Oregon, Jesse Applegate and Levi Scott led an exploring party in 1846 to the California Trail on the Humboldt River near what was later to be known as Lassen Meadows (which is at the north end of present day Rye Patch Reservoir). 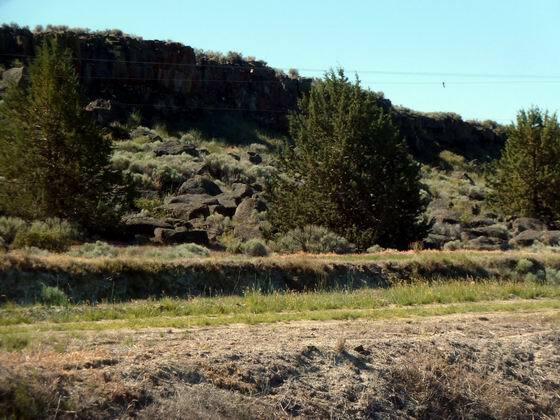 From there they guided a wagon train across the Black Rock Desert, through High Rock Canyon, to Goose Lake, and then westward to Oregon and its Willamette Valley. 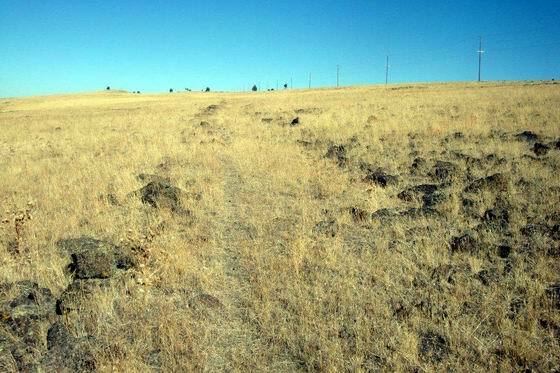 This wagon trail became known as the Applegate Trail or South Road to Oregon. 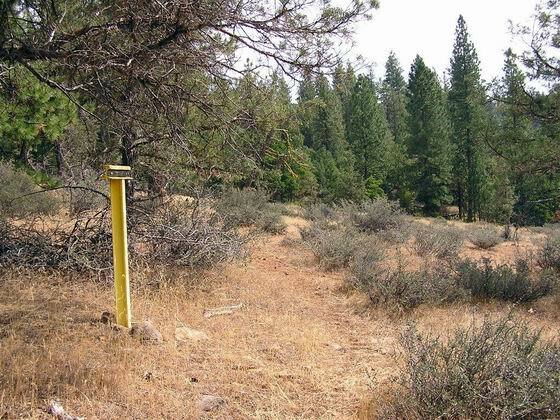 During the Gold Rush years, the Applegate Trail was used also to reach mining towns in northern California by way of the Lassen Trail, Nobles Trail, and Yreka Trail. 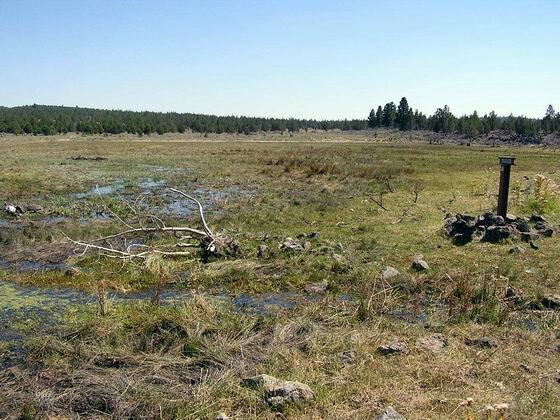 For more information on the opening and development of the Applegate Trail, see Trails West’s A Guide To The Applegate Trail From Lassen Meadows To Goose Lake and A Guide To The Applegate Trail From Goose Lake To Southern Oregon. 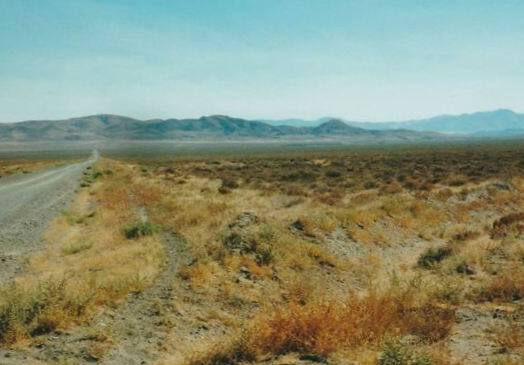 Enjoy your photo tour of this historic emigrant trail. 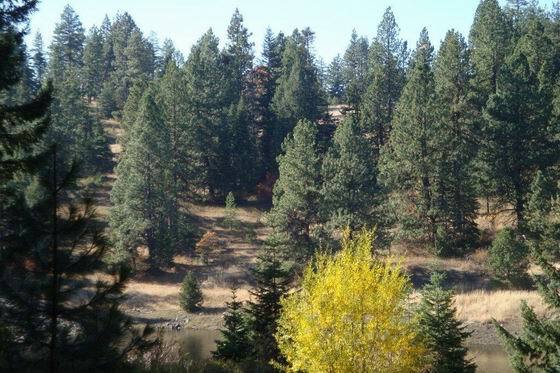 Here is a small collection of photos taken along the Applegate Trail, the South Road to Oregon. 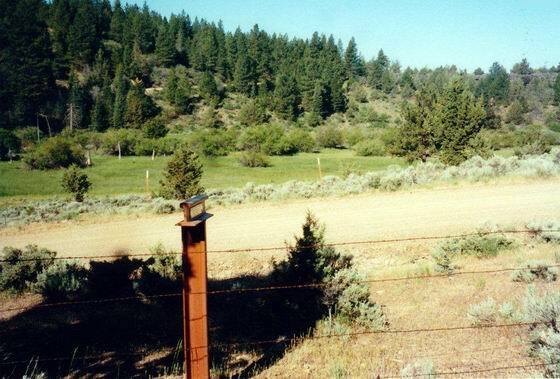 This segment of the emigrant trail stretches from Lassen Meadows located at the north end of present-day Rye Patch Reservoir in Nevada to Goose Lake in northern California and then across southern Oregon to its end near Ashland, Oregon. Driving the Applegate Trail is a lonely experience. 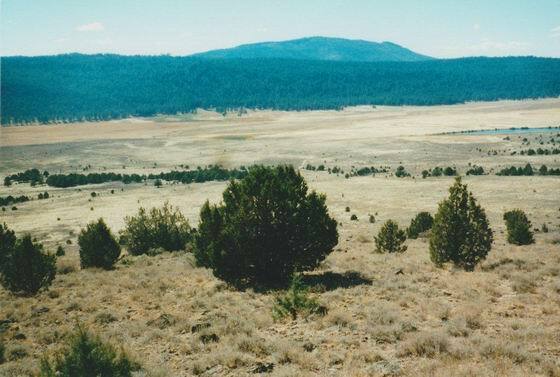 This photo was taken just west of Rye Patch Reservoir (Lassen Meadows area) heading west toward Antelope Summit. At this point, the trail is to the south (your left) of the bladed road. A little further on, the trail crosses the road to Marker A-3. From this marker, the original trail heads west, nearly parallel to the bladed road, all the way to Marker A-4. Photo by Bob Black. 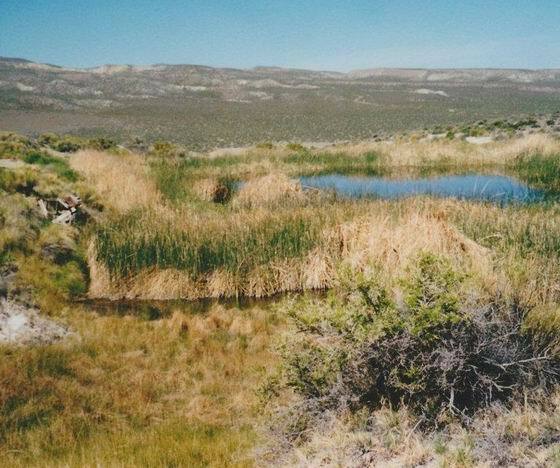 This spring area was probably the original water source mentioned in emigrant diaries. It was likely improved by the later users of the roadside station located here along the Humboldt Road. Photo by Bob Black. This spring was heavily used by the emigrants. 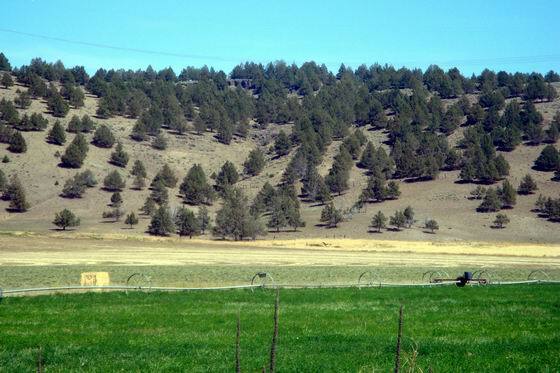 It is located about 1 ½ miles south of Marker A-5 and west of the end of the dirt road. There are several other spring seeps located above the main spring. This spring was improved by Col. Lander when he constructed a small reservoir here. 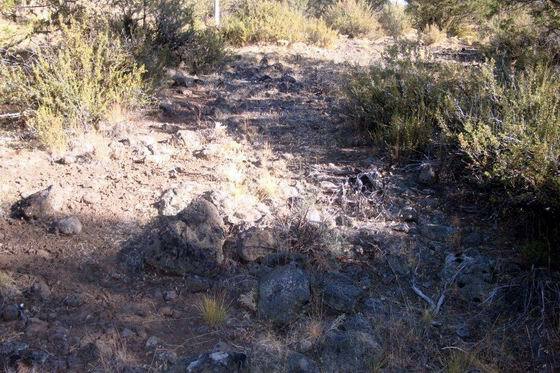 No evidence of this work, or the original trail to and from the spring, is visible. Photo by Bob Black. 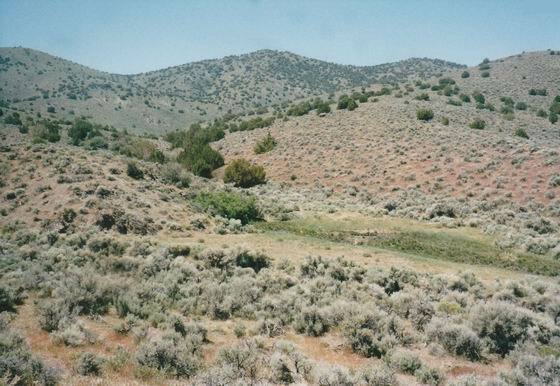 From the summit, the trail is either on or adjacent to the dirt road as it winds down and across the lonely, rocky country for about five miles to the junction with a bladed road and Marker A-7. Photo by Bob Black. From Marker A-7, the trail, which is now the dirt road, winds up the gentle, brush-covered slope in a northwest direction for about three miles to Kamma Pass. Photo by Bob Black. From the summit, the trail, now the dirt road, winds slowly down the sage-covered wash toward Painted Canyon. Photo by Bob Black. After traveling down the wash about two miles from the summit, look to the right of the driving route. If the light is just about right, the layers of colored clay deposits are very colorful. 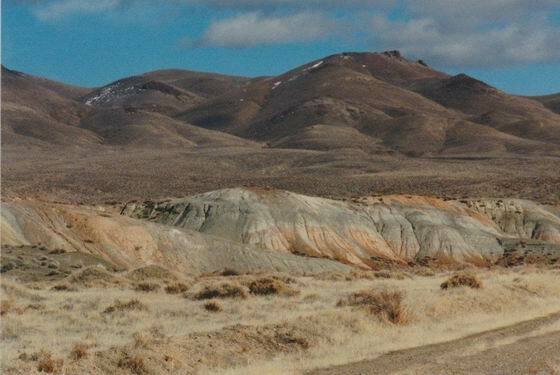 This area was described by several emigrants with the following phrases: “we passed the most beautiful hills of colored earth,” “various colors appears in stripes and patches,” and “high clay bluffs and hill, of the most delicate and beautiful warm tints, in horizontal strata.” Photo by Bob Black. Rabbit Hole Spring has been “improved” several times in the past with the result that it no longer looks like it did when the emigrants passed this way. In the middle is the pool created when the spring was “improved.” You should see what it looked like when J. Goldsborough Bruff passed by it in 1849. A copy of his sketch of the springs is included in the Trails West Applegate Trail Guide. Photo by Bob Black. 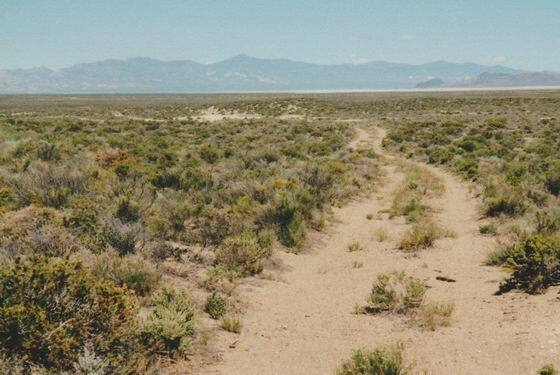 From Marker A-9, the driving road overlays the trail as it goes about a mile northwest to Marker A-10. 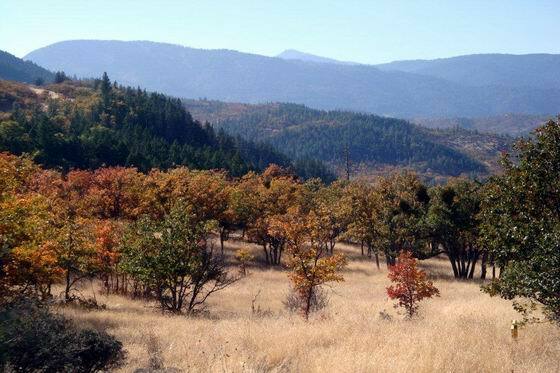 At this location in 1854, an alternate route of the Nobles Trail branched off the Applegate Trail and headed west toward Granite Creek. The driving road heading northwest from Rabbit Hole Spring is long and dreary. It is a fairly good road, but there are gullies and dips that slow you down. 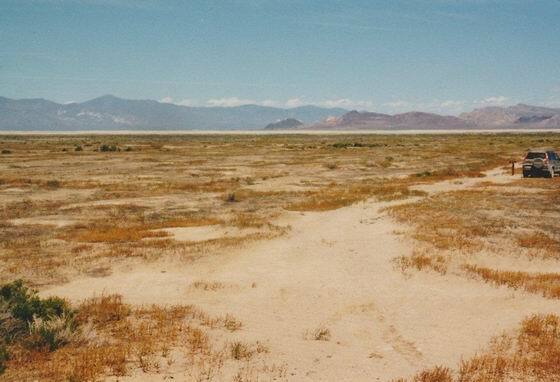 In the distance you can see Black Rock Mountain and the Calico Hills on the other side of the Black Rock Desert Playa. Photo by Bob Black. After you drive through the remains of Sulphur, you get to the Black Rock Desert. 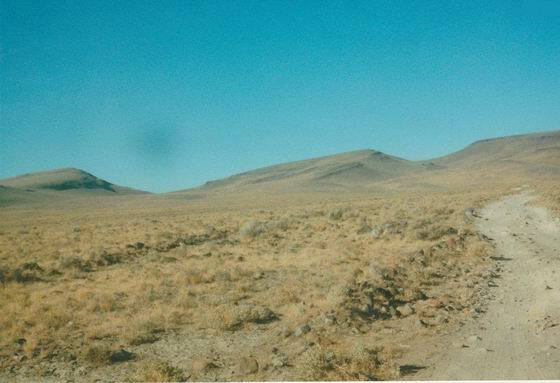 It is hard to describe what the desert looks like so you will just have to look at the photo. 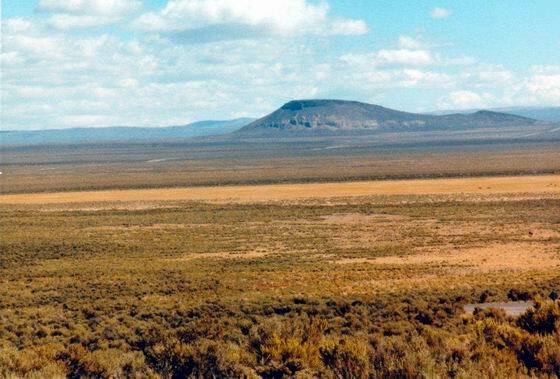 Black Rock Mountain and the Calico Hills can be seen off in the distance. And, you can just barely make out the Black Rock Playa. Photo by Bob Black. The Quinn River is a seasonal river that can prevent you from continuing on to Black Rock Springs. Because it was dry when this photo was taken, it was easy to cross. But, it may not be dry when you get to it and you could get stuck. Consequently, you should always stop your vehicle when you get to the river and walk back and forth across it to determine if it is dry enough to cross. If in doubt, do not attempt to cross over in your vehicle. 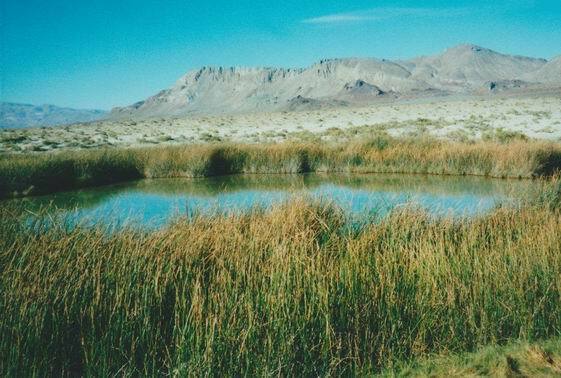 Instead, make a detour by returning to Sulphur (site) and driving to Gerlach and then to Black Rock Springs. The Trails West Guide to the Applegate Trail contains instructions for making this detour. Photo by Bob Black. 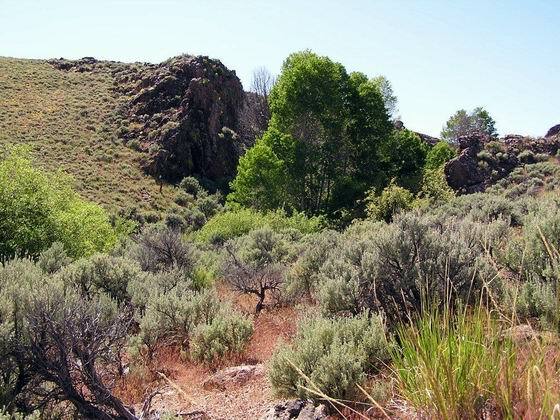 Black Rock was one of the major landmarks used by the emigrants as they traveled the Applegate Trail. As shown in several of the previous photos, Black Rock can be seen for many miles from the east. This photo was taken from right below the mountain looking to the north. 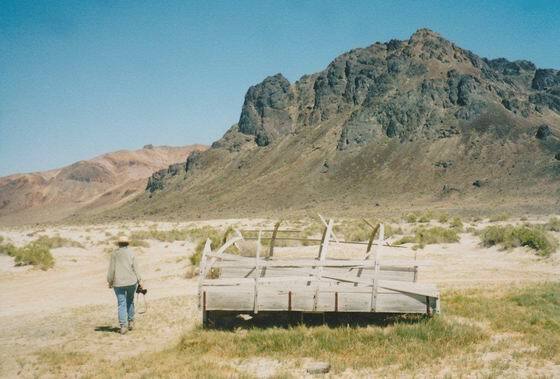 The remains of the wagon in the foreground is from a sheep herder, not the emigrants. 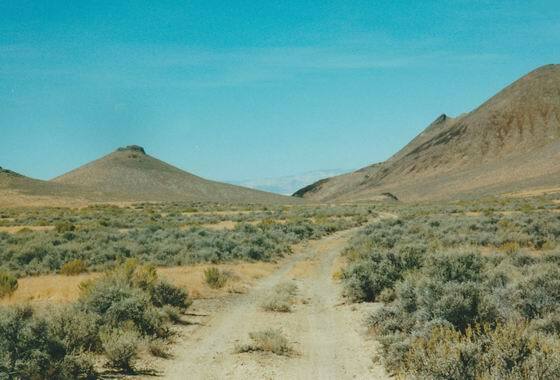 In 1852, the original route of the Nobles Trail branched off the Applegate Trail near this location and headed southwest across the Black Rock Desert to Granite Creek. Photo by Bob Black. A view of Black Rock Hot Springs with the the Calico Mountains in the background. 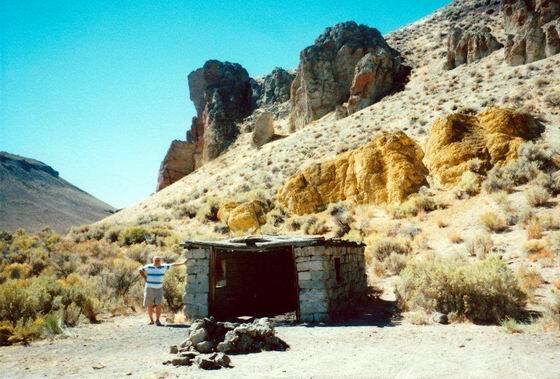 Both Black Rock and Double Hot Springs, located to the west, plus Trego Hot Spring, located to the southeast, lie on a geological fault line running from the south-southeast to the north-northwest. This fault is approximately 35 miles long and has experienced at least one earthquake. Photo by Bob Black. 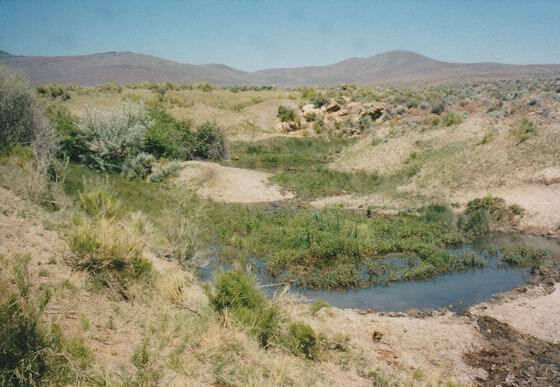 The swales heading from Mud Meadow up to where the emigrants could enter Fly Canyon are obvious in several places in this area. The trail to the head of Fly Canyon passed through the left saddle in the ridge. 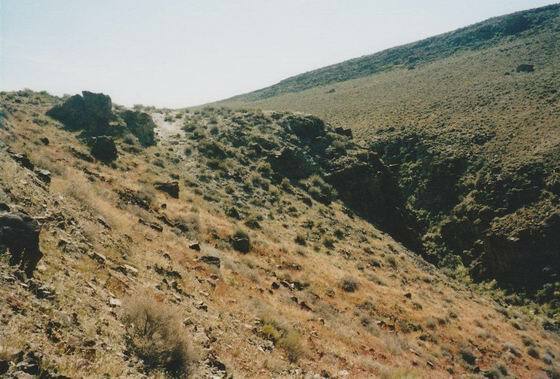 The alternate trail route, used in later years and which by-passed Fly Canyon, passed through the saddle on the right. Photo by Bob Black. This photo does not really show the steep slope the emigrants had to lower their wagons down to get to the bottom of Fly Canyon. A number of wagons were destroyed when they fell to the bottom. The alternate trail route by-passed this dangerous area. Photo by Bob Black. This is the beginning of High Rock Canyon, one of the more spectacular segments of the Applegate Trail. Here the canyon became very narrow with high rock walls rising above the trail. Photo by Bob Black. 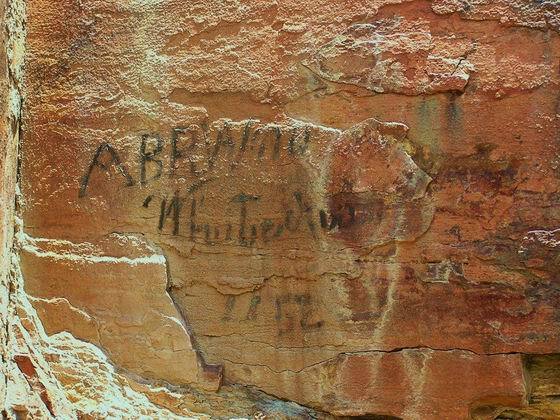 These canyon walls were irresistible to some of the emigrants and they wrote their names and dates on the rock with axle grease from the wagons. Photo by Bob Black. 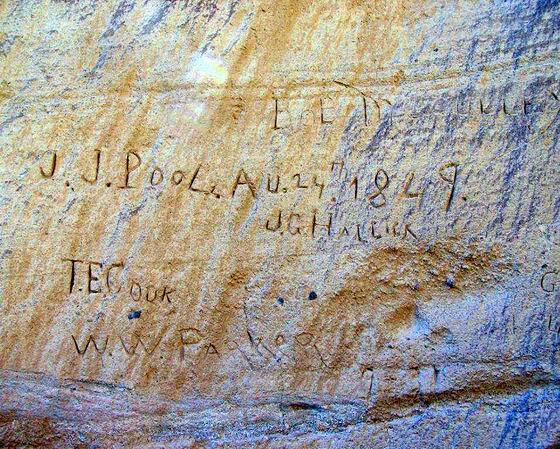 Other emigrants scratched names and dates right into the rock. It’s pretty special to be able to stand at this same spot over 160 years later and imagine these folks going right through this area. Photo by Bob Black. This fellow must have been tireder the the others. He just went with his initials. Photo by Bob Black. Old George here must have had more time then the others. Not only did he take the time to etch his full name, he also wrote out the date and where he was from. Photo by Bob Black. Driving the High Rock Canyon is spectacular – if you can stop watching the rough, narrow dirt road long enough to look at the scenery. Photo by Bob Black. The road and the trail both pass through the narrow slot in the canyon walls. Photo by Bob Black. This side canyon was named for its yellow cliffs. The area next to the abandoned rock building is a favorite spot to stop and take pictures. Photo by Bill Bishell. This photo shows the vegetation-choked entrance to the upper canyon. 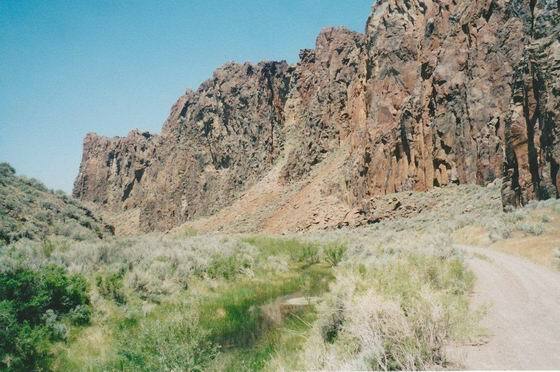 In the fall of 1853, this small canyon became impassable, probably due to a rock slide. 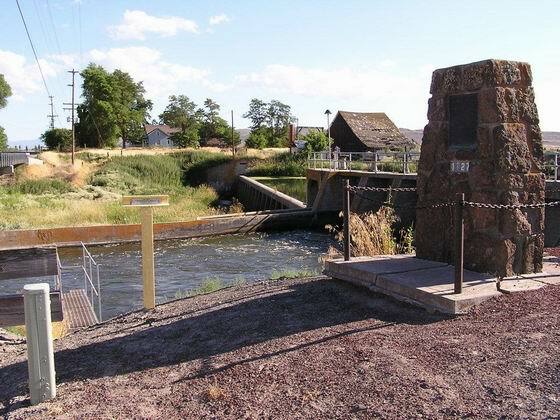 A detour route, about four miles long, was opened for use by the emigrants in 1854. 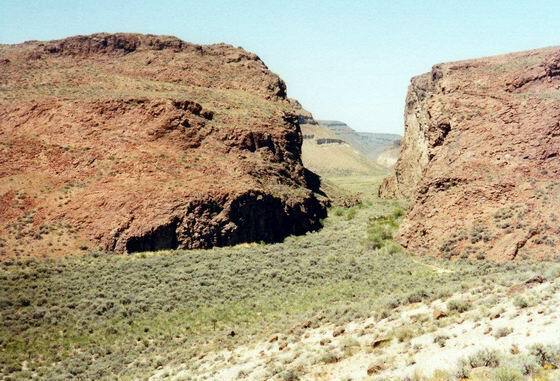 It went around to the east, then north up the present bladed road and then west to the upper end of this canyon. Photo by Bob Black. Just below this small meadow, the trail emerged from the upper canyon. This was also the location where the detour route rejoined the original trail. In 1849, J. Goldsborough Bruff described this area as “a ledge of moss covered granite rocks, from under which gushed a fine cool spring, with a green marshy space around it.” Photo by Bill Bishell. 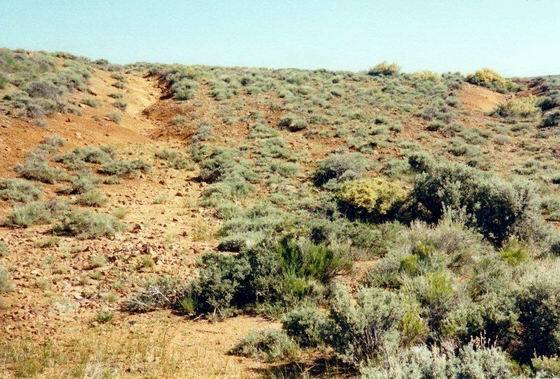 The two eroded red dirt trail swales mark the emigrant’s route as they left the upper canyon and headed northwest up the sage covered hillside. Photo by Bob Black. On September 29, 1849, a shetch of a “singular rock on left of road” was made by J. Goldsborough Bruff. This singular rock is shown in the photo above. 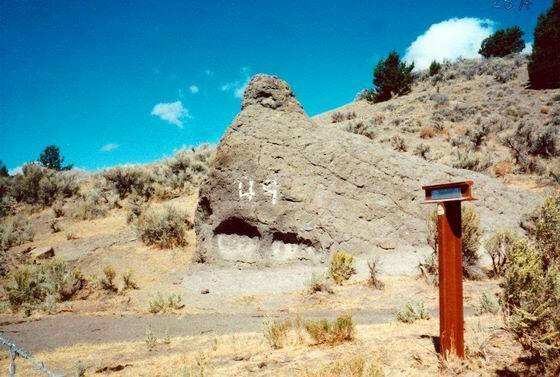 The rock is located on the Applegate Trail near the present-day Massacre Ranch. To see J. Goldsborough Bruff’s sketch of the rock he made famous, see the Trails West Guide to the Applegate Trail. Photo by Bob Black. Looking east across Long Valley toward Painted Point. 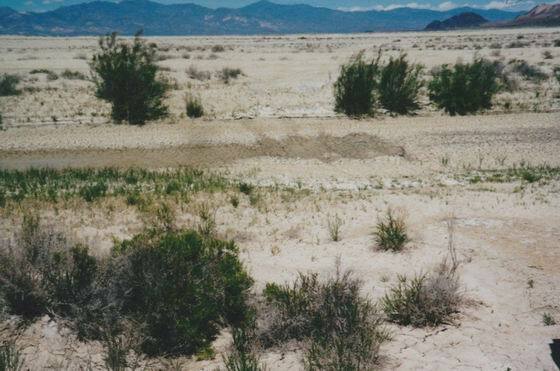 A dry Forty Nine Lake shows up in the photo as a light colored meadow. The main branch of the trail came across it, when it was dry, on the way to Little Mountain Pass. Photo by Bob Black. The trail ran at the edge of the creek to the left of the driving road. The old Forty Nine House, once a wayside stopping point along the freight and stage road, used to stand near the Forty Nine Rock, but it burned down many years ago. 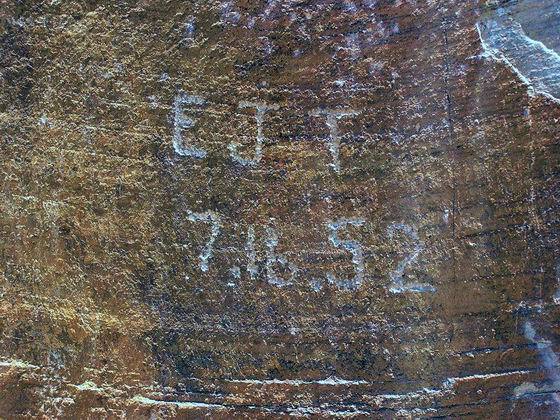 The figure “49” supposedly was painted on the rock by emigrants with axle grease. 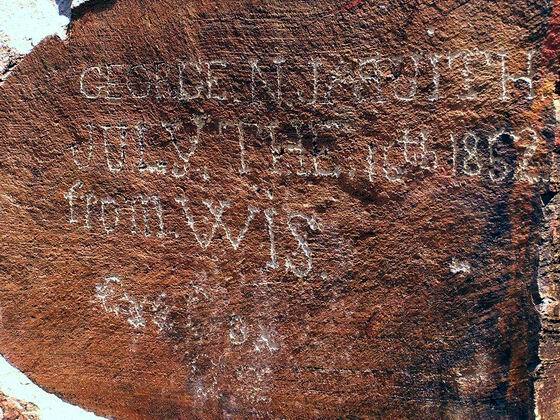 It has been repainted so many times that it now stands out in relief about an inch from the eroding surface of the rock. Photo by Bob Black. 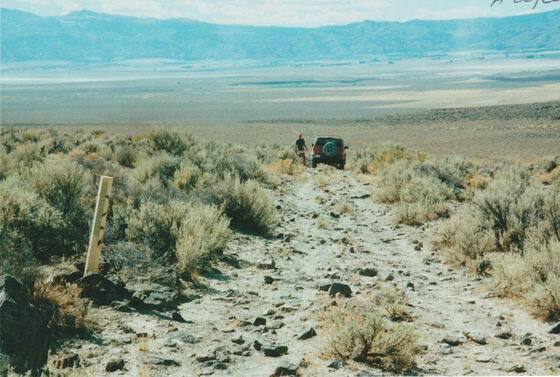 The trail goes west toward Surprise Valley from the Nevada-California state line (marked by the yellow post). The trail is on or adjacent to the rough, rocky road as it heads down to the Hot Spring near Upper Alkali Lake. Photo by Bob Black. The trail came up the gentle slope from Upper Alkali Lake to the small lake on a flat area. Here the emigrants rested their animals before starting the steep climb up to the top of the pass. Photo by Bob Black. On this small bench about half-way up the slope, the emigrants stopped and double-teamed their wagons for the pull up the last steep pitch to the top of the pass. Photo by Bob Black. Once over the pass at Marker A-28B, the descent to the valley below was steep and dusty. Because the trail was so dusty, several alternate trails were developed as the emigrants seeked an easier way down the west side of the mountain. These numerous trail variants are easily visible today. Photo by Bob Black. Near Marker A-30 on the west side of the valley, at the edge of the timber near the driving road, excellent trail swales are readily visible, The emigrants moved rocks out of the roadway in order to make the wagon travel easier. The swales extend for a distance of about 100 yards, and multiple swales are visible in two locations. 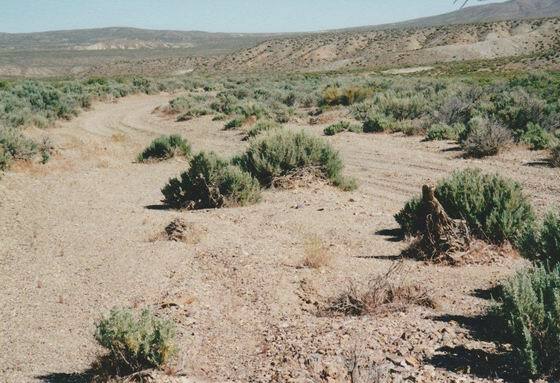 This section of the trail, from the driving road eastward to the west side of Fandango Valley, has been cleared of brush and debris and marked with inter-visible Carsonite markers. 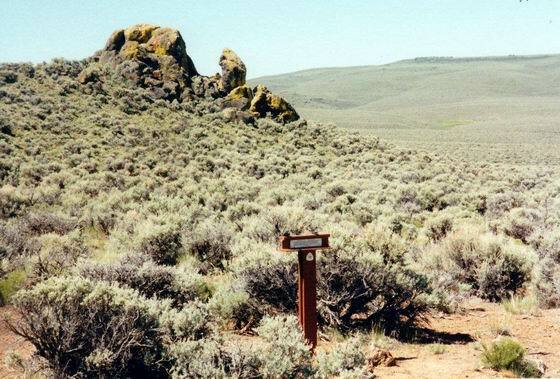 It makes a great hiking trail for emigrant trail enthusiasts who are interested in viewing a great section of original emigrant trail. Photo by Bob Black. 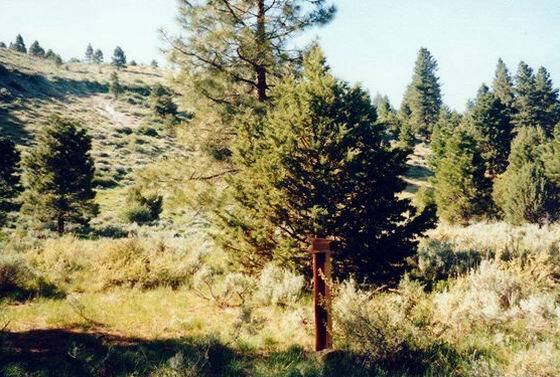 The trail descends the hill east of Lassen Creek and appears near the marker as a visible swale. 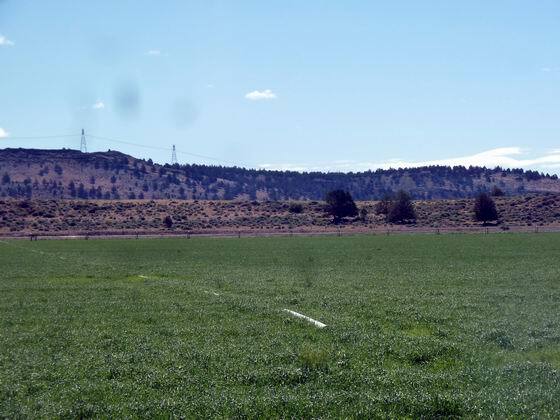 It crosses the road and continues as a faint trace through the heavy sage brush down to Lassen Creek. 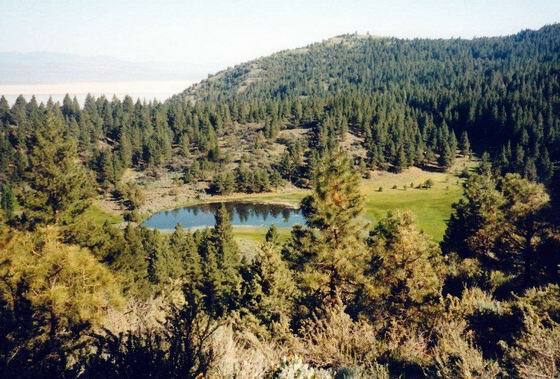 Once across the creek, the trail heads west to the edge of the rim above Goose Lake. Photo by Bob Black. The trail crossed the flat area west of the highway and then began the steep descent down to the edge of the lake. 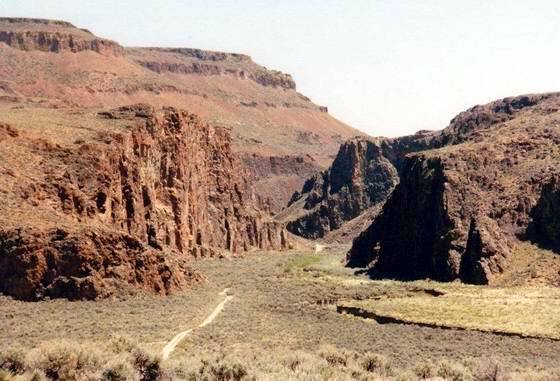 A later wagon road is readily visible as it makes several switchbacks down the through the rocky area just below the rim. Once the trail reaches the bottom of the slope, it turns south and generally follows the corridor of the present railroad to the south end of Goose Lake. At that point, the trail branched. 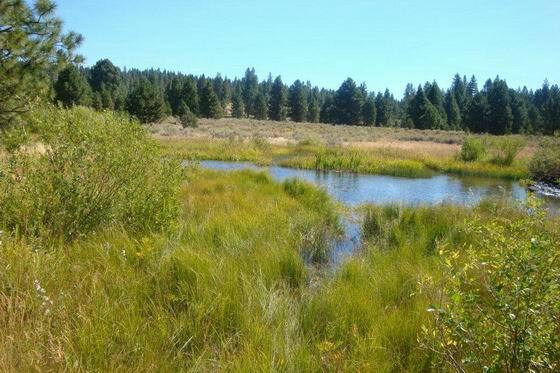 The Lassen Trail continued south down the Pit River and the Applegate Trail headed west toward southern Oregon. Photo by Bob Black. 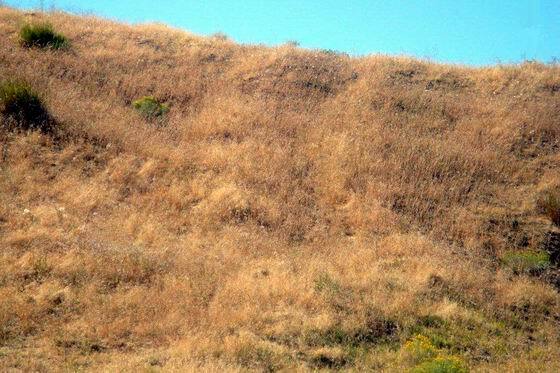 If you look closely at the photo, you can see an original section of the 1846-1851 trail. 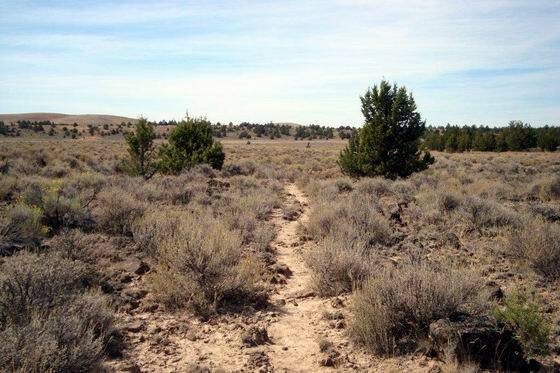 The trail goes northwest past Marker A-34 on the way from the west edge of Goose Lake to the junction with the 1853 trail in Devils Garden. The trail route in the photo came across Goose Lake during the low water years of 1846-1851. In later years, the water level of the lake came up and the trail route was shifted around to the south end of Goose Lake. Photo by Bob Black. 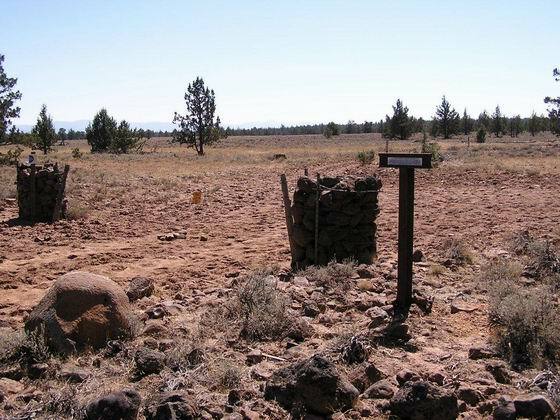 Marker A-35 shown in this photo is located in what became known as the Devil’s Garden because of the very rocky terrain the emigrants had to travel over. Emigrant diaries often included comments on how difficult it was to travel this portion of the trail. This is where the 1846 route and the 1853 route of the Applegate Trail joined. The two piles of rocks to the left of the marker are 3-plus foot diameter, rock-filled columns used to anchor the ends of the fence that encloses the area in back of the marker. Such anchors are used because it is almost impossible to dig a post hole in the rocks that cover the area. Photo by Bob Black. This view is down a section of original trail on the west side of Blue Mountain. If you look closely, you might be able to see the rocks that have been moved to the sides of the trail. This section is between Marker A-39 and Pothole Spring. Photo by Bob Black. In the photo, Marker A-40 is about ten feet to the right of the grave of Lloyd Dean Shook. He was apparently an emigrant, though no diary information concerning him has been located, and was buried here in 1851. Pothole Spring gushes out of the ground in the foreground. This spring was described by several emigrants as “a spring of warm water” and a “spring somewhat warm.” Photo by Bob Black. 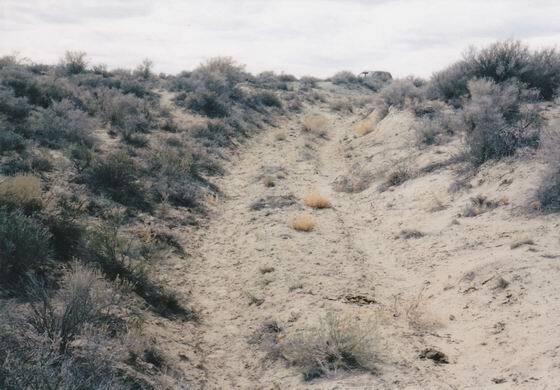 There are several sections of original trail, like the “swales” shown in the photo, along the driving road that heads northwest from Pothole Spring toward Steele Swamp and Marker A-41. Photo by Bob Black. This neat section of original trail is located west of Steele Swamp on the way to Clear Lake. It has had a small amount of use as a ranch road in recent years, but it still looks much the same today as when the emigrants traveled on it. It is fairly difficult to drive to this section of trail, but for the adventure-oriented “rut nut”, it is well worth the trip. Photo by Bob Black. 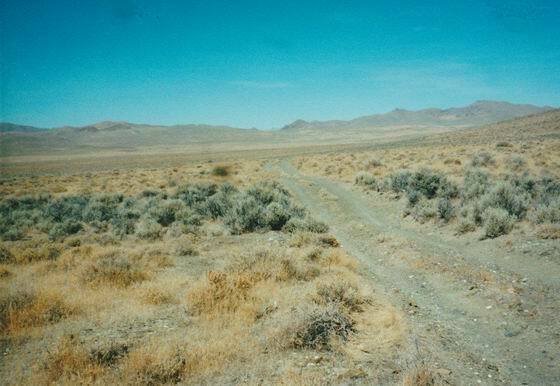 This section of original trail goes west from Clear Lake toward Tule Lake. 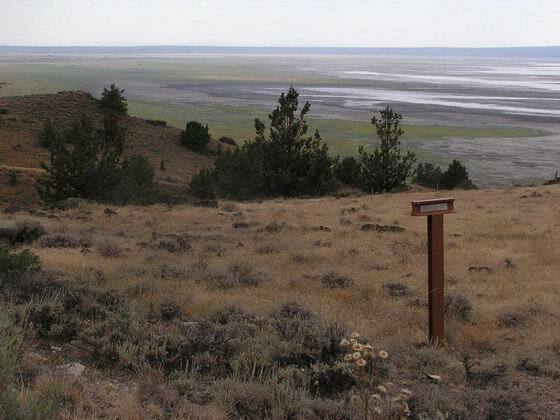 The first 1 ½ miles of this trail makes a good hike since it goes across gentle ground and is marked with Carsonite markers. The best part—both ends of the hike are accessible by a vehicle! Photo by Bob Black. 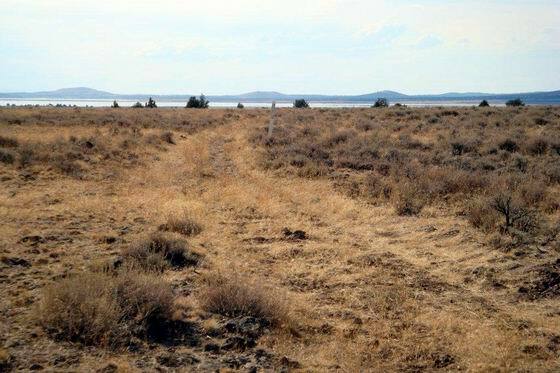 From 1846-50, the trail dropped down the steep slope from the plateau, which extended west from the hills east of Marker A-44, to the edge of the lake bed of Tule Lake. It then headed west across the lake bed toward Lost River. In 1851-52, the rising water level of the lake forced the trail, which was at the toe of the slope on the lake bed, to turn to the left (north) and head toward Bloody Point. From 1848-50, the Burnett Cutoff turned to the right (south) at the toe of the slope. 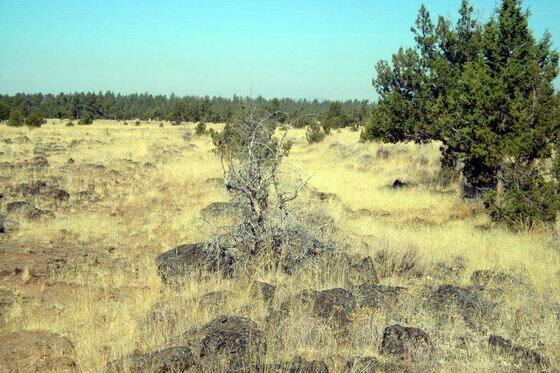 From 1851 and later, the Burnett Cutoff left the Applegate Trail at the east edge of the plateau east of Marker A-44. Photo by Bob Black. The original native- rock Stone Bridge, which was located beneath the existing irrigation dam, provided the only fairly accessible way to cross Lost River for the early Indians, fur trappers and emigrants. The stone monument honors the members of the Applegate Trail exploring party who located the trail in 1846 from the Willamette Valley in Oregon to the Humboldt River in Nevada. Photo by Bob Black. A short distance south of Marker A-47, the trail, now an eroded gully, climbed up and over this steep hill. This route was necessary because further west all travel was blocked by Lower Klamath Lake. This hill side was the location for an incredible feat. As the wagons were going up the hill, the tongue on one of the wagons broke into pieces. This allowed the wagon to start to roll back down the hill. A woman, walking along the side of the wagon, immediately grabbed a large rock and jammed it behind one of the wheels. 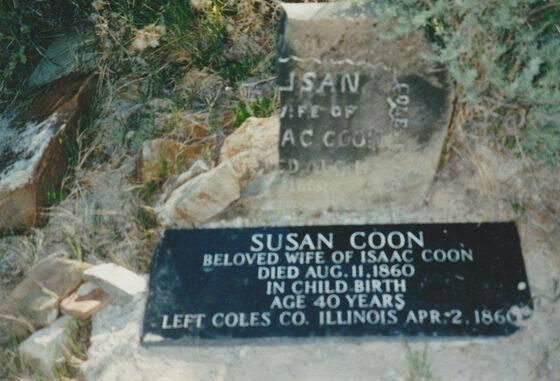 Her fast action stopped the wagon and likely saved the life of a small child riding in the wagon! Photo by Bob Black. 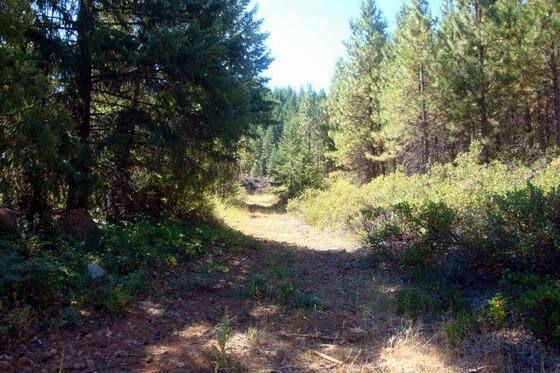 This section of original trail is located at the south end of Sardine Flat, one of the heavily used camping areas along the trail. During high water years, the emigrants were forced to climb up the slope in order to travel around the lake. 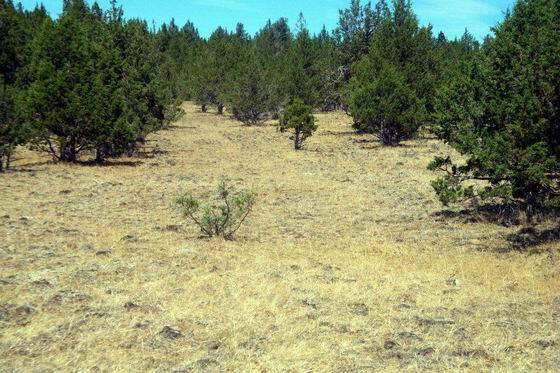 The photos shows three distinct trail swales which mark the lines of travel over the ridge. Photo by Bob Black. 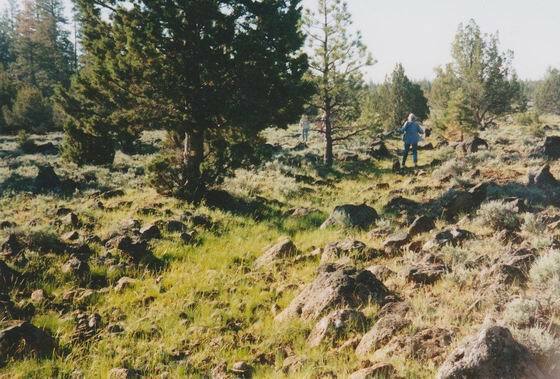 This section of original trail, with the rows of rock tossed neatly to the side, is coming down a rocky hillside on the way to the lava field at the south end of Lower Klamath Lake. 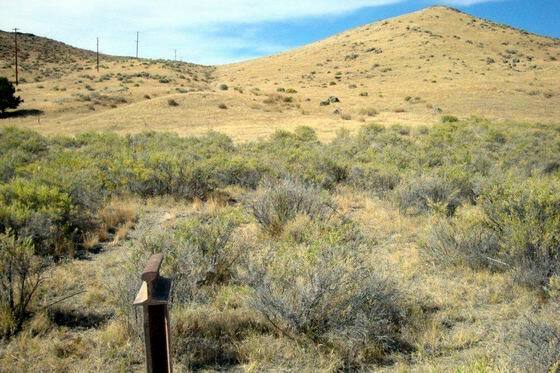 This site is a few miles east of the flat where the Yreka Trail branched off the Applegate Trail starting in 1852. Photo by Bob Black. After making a big detour to the south in order to get past Lower Klamath Lake, the trail passed by this area on the way to the ford of the Klamath River. When the trail was located in 1846, this section of original trail was actually in Mexico. 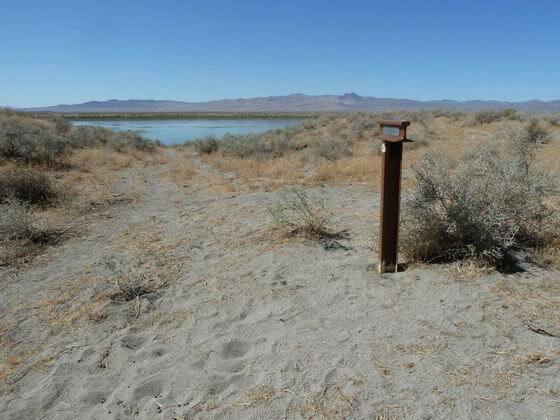 The state line, which was surveyed a few years later after California became a state, is about a hundred yards further north. If you have a chance, be sure to visit the very informative display in the Landrum Wayside located here on the west side of Highway 97. Photo by Bob Black. This is the site of the ford for the 1846 trail route. The trail is very visible as it gets a small amount of current vehicle use. This route was only used for one year. 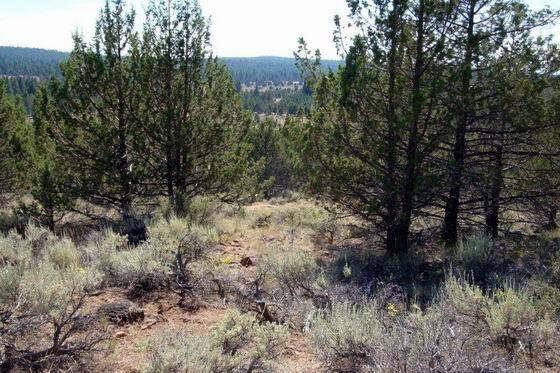 Beginning in 1847, the trail forded the Klamath River about a mile downstream and bypassed this section of trail. Photo by Bob Black. The trail is shown as it starts the steep climb up the mountain. This climb consists of two steep pitches with a fairly flat section of trail between them. The emigrants described this section of trail as “road bad and rough” and “hilly stony roads.” Photo by Bob Black. Looking up the trail as it comes down to the top of the final drop down to Jenny Creek. This “slide” was one of several very steep sections of trail traversed between the Klamath River and the Rogue Valley. The rear wheels of the wagons were often locked with chains to help keep them under control. Photo by Bob Black. The steep section of the trail is beneath the waters of the little reservoir seen in the bottom of the photo. In 1852, William Cochran Stoddard said that this location was “the steepest mountain that ever I saw a wagon drive down.” The trail is visible across the reservoir as it climbs up through the meadows on the east side of Green Springs Mountain. Photo by Bob Black. After resting near the grass and water in the area now known as School House Ranch, the emigrants headed on down the oak-covered ridge between two small creeks. At the end of the ridge, there was a short, but very steep, drop down into School House Creek. The next several miles down this creek, and then Tyler Creek, was one of the most brushy sections of trail that the emigrants had encountered. Photo by Bob Black. 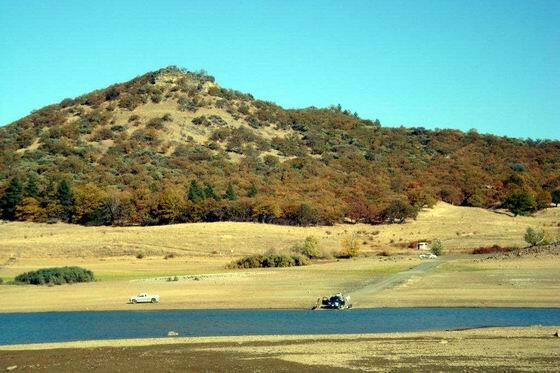 The photo was taken when Emigrant Lake was nearly dry. The Applegate Trail came down the slope across Hill creek where old Highway 66 is visible now. The trail then turned north and went on down the creek to the Hill family homestead. 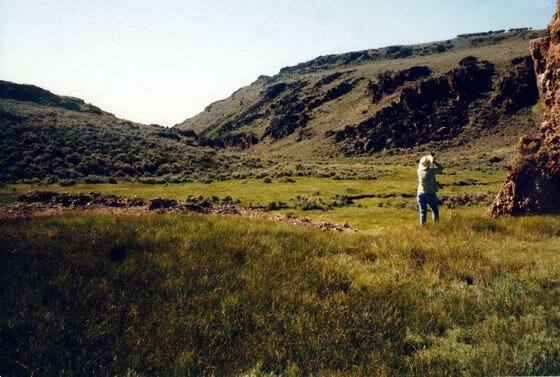 At that location, it intersected the old Hudson Bay trapper trail, also known as the Oregon to California trail. It then generally followed this trail north to Ashland Mills and then on to the Willamette Valley.